We started our day with creek play at Peri Park, it has changed so much since our wet and rainy winter filled the creek with fast rushing water. 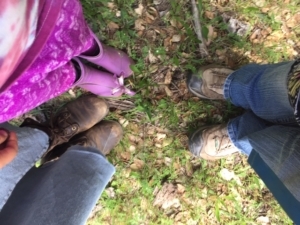 It was much calmer today and friends wearing rain boots splashed across. Miles even found a baseball in the creek! There was some warm and wonderful weather at Lake Lagunitas and Grandfather Sun was smiling in the sky as we set up in the meadow. There were many new signs of spring dotting the hill, Ruby’s favorite Douglas Iris! We only had four Tender Trackers today as Charlie, Margot and Violet were away on other adventures. 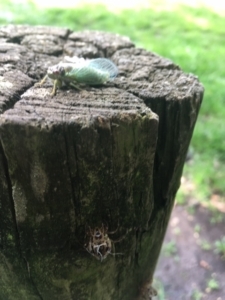 While exploring, we noticed some interesting insects- cicadas! We found two that had recently molted from their exoskeletons. We watched them climb the drinking fountain for a good amount of time, one was reddish and one was greenish. They were both slow and quiet. When we listened, we could hear other cicadas clicking and singing in the trees around us. Before we set off on our big adventure, we dropped off our snack stuff at Juniper Rose. We remember our handprints on the big bus and gave our painted hand some high-fives. Then, a cicada landed on me! It was another opportunity to look more closely at this winged wonder. We took turns holding it and watching it crawl, and this cicada in particular, really liked Siena. It crawled up her arm, tickling the whole way. It stayed on her shoulder, explored her walking stick, sat in her hand. Buggy the cicada accompanied us on our walk, and as we reached Rohan’s Baby Tree, we gave gentle hugs to our favorite conifer and set Buggy on a branch. Our favorite fallen tree was covered in turtles where the upper branches sit in the water, and we successfully snuck up and many stayed. The tree turned into a Spaceship and then a Pirate Ship! Blake was the captain, Rohan steered the ship, and Miles was in charge of the defenses. Siena and I harvested some cattail fluff. I held her hand as she balanced on a long in the water and reached and reached to the tall stalks. When she had acquired a soft handful, she made me a jacket by pressing some of the fluffy seeds on my shirt. She wore some, too! During lunch we saw and heard acorn woodpeckers and red-winged blackbirds. We played I-Spy and pointed to the bird calls we could hear. After lunch there was more pirate play and Ruby and I got permission to come aboard. We did very pirate-y things and even got our pirate hooks stuck together! On our way back to Juniper Rose, we looked for Buggy on Baby Tree, but he had flown away. There was a steep trail that everyone got a chance to climb, (and slide down a little, too) and Blake was a caring Guardian of Safety when friends tumbled. Once on the bus, we shared our gratitude for a day filled with cicadas, sunshine, flowers, climbing, blue sky, turtles and pirates! This was our first day back from Holiday and all were present, alive and ready to go. The weather was welcoming, and easy. Some were dressed in our usual ensemble of rain clothes of varying degrees and rain boots. But, alas, there was NO need!!! This day got very warm. Could it be that Spring and fairly consistent warm weather is here, TO STAY!!???? We had our circle and read a lovely story that we read every time this year called Rabbits Wedding. It is a most beautiful story with perfect illustrations that represent the innocence and beauty of this age of children. Ruby and I wanted to really take advantage of this warm and wonderful day as well as the fact that the children are getting much older and stronger so, we packed up and made our way to a place they have gone a few times. It is a bit of a walk but in truth, for you, a grown up, it is only about an 8 minute walk. For us though, about 20 to 30 minutes depending on who might have fallen or what marvels and wonders we discover along the way. And, that is indeed what happened. Spring is ALIVE now and there just are so many bugs, plants, and birds to see, hear and discover. The Turtles were out upon the logs, and we had to spend time with them. The Fairy Pond was full and the big steps were there to be climbed up with their much stronger legs than they had at the beginning of the year. When we got to our spot, the place where the BIG fallen down tree makes itself available to climb up and down, they all gave it a go. Some are able to climb up it and some still have some learning to do as to how to get up on their own and navigate up this big thing without falling. Taking turns climbing was a great adventure for them as well. The cattails loved being played with and Nelly, Ellery and Sienna had fun down by the waters edge figuring out how to wash their hot faces. The edge of the water had a little slope and that took some figuring out how to get their short arms in the water without falling in! All the children had a grand time yet, as happens and almost always far too soon, we needed to pack up and go back to the bus. Some of them got a bit draggy as their clothes were, no matter how much we took off, too warm. We did make it back to the car though. There we had such fine thank you’s and Ruby’s expertise with telling such a beautiful story of the day with the Kalimba all the way home. And, at the beginning of the day Gideon and Nathan were having such a GRAND time rhyming with each other. It was so wonderful that they had us all in great belly laughs of fun from the listening. Addie just had so much to say throughout the day and Rohin was his usual happy self. You heard a bit about the others above. Today was a BEAUTIFUL bright, sunny, spring day and it seemed like the perfect time to go to this place. It is also the time when the Ceanothus plant is in bloom and ready to gather. The flower on this tree is good for making soap. Josie brought her Mom and brother and met us there. This was a treat for all. When we got there we went straight away to give thanks to the Ceanothus tree and then gather some of plants flowers. We then went inside the Sanctuary, down to a little spot for a small circle there and checked this place out. I then showed them how to wash their hands with this plant as well as showed them some plaster casts of tracks. This was our preparation for what we were to do later in the day with our OWN feet! The walk down to the “beach” had some places where we all got to smell the air and feel where we thought the water was and then, down the chosen path we went. And, it did bring us right to the beach. The tide was high yet left us room to put our things on the collecting tables and, the children were off! The boys went straight away, particularly Theo, to gathering treasures and putting them on the high tables. Ellie and Ruby wound up making an incredible small labyrinth with the rocks found. Josie went with her brother and Mom as well as with Luna and the boys to a tree further down the beach and there is where they all wound up playing for a good part of the day. The tree had nooks and crannies to climb up and explore, opportunities to take turns, ride on it like a big ship and become many things that only ones active and alive imaginations could create. All the while I was doing my best to make plaster casts of their feet. The ground was not perfect for it and, my casts were not all that grand either. In the end, only two out of four came out sufficient to the task. Josie and Theo did not want to partake on this day. No worries, I am hoping for better ground to get cleaner casts. We did found lot’s of other animal tracks though and all had a good time looking at those! When it came time to eating we all did our best to eat upon a particular low lying log. There was some figuring out needed in order to find an easy way to eat. This was found and most of the food was eaten. Then back to play they went! Luna took all her wet clothes accept her underwear off and Ellie really wanted to follow suite. So, she did. Josie got quite wet as well and by days end chose to ride home in the bus with us. When we got to the bus at the end of the day a great outdoor changing party took place with ease and fun. It was a beautiful, imaginative, playful, tide exploring, track finding, warm weather receiving day of delight. We look forward to more of this kind of weather. As I watched them though it seems that whether it is water from the sky or water from the lakes, bays and streams, they enjoy WATER! The ride home was filled with a grand! story from Ruby. She told a story that we typically read this time of year called The Country Bunny. Her retelling, I do believe, was grander than the book has ever been!